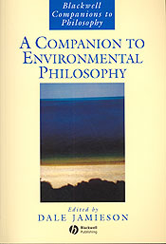 A Companion to Environmental Philosophy is a pioneering work in the burgeoning field of environmental philosophy. This ground-breaking volume contains original articles written by international scholars exemplifying the rich diversity of scholarship in this field . Traces the roots of environmental philosophy through the exploration of cultural traditions from around the world. Brings environmental philosophy into conversation with other fields and disciplines such as literature, economics, ecology, and law. Discusses environmental problems that stimulate current debates.